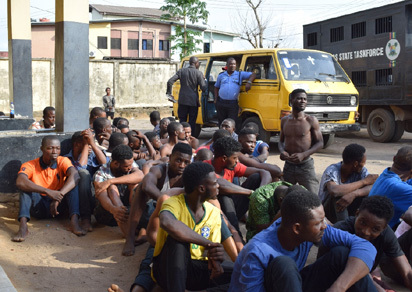 Suspected cultists numbering 50 said to be on their way to a burial ceremony in Isiala Mbano local government area in Imo state, were yesterday arrested by the police, for alleged possession of firearms. The Imo state Police Public Relation Officer, PPRO, Mr Andrew Enwerem confirmed this to Vanguard in Owerri. According to Enwerem, “The 72 suspected cultists were on transit from Rivers to Isiala Mbano, for a burial of their suspected member. “Getting to Bank road by Tetlow, they were intercepted by the eagle eye operatives. Upon suspicion the police decided to search their vehicle, discovered four automatic pistols two Eglish pistols. An eyewittness told Vanguard that “The cultists did not want to stop when the police stopped them. It was when police called more of their men they boys decided to surrender.